Twelve people have walked on the moon. 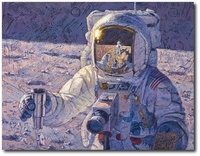 Only one was an explorer artist, Alan Bean—Apollo XII astronaut, commander of Skylab II and artist. Born in 1932 in Wheeler, Texas, Alan was selected for an NROTC scholarship at the University of Texas at Austin in 1950. Alan was commissioned an ensign in the United States Navy in 1955. 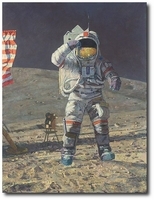 Holder of eleven world records in space and astronautics, Alan Bean has had a most distinguished peacetime career. 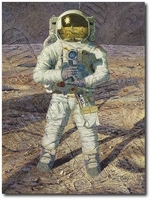 His awards include two NASA Distinguished Service Medals, the Yuri Gagarin Gold Medal and the Robert J. Collier Trophy. 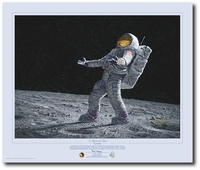 As part of the Apollo XII crew, he became the fourth of only twelve men ever to walk on the Moon. As the spacecraft commander of Skylab Mission II, he set a world record: 24,400,000 miles traveled during the 59-day flight. When he wasn’t flying, Bean always enjoyed painting as a hobby. 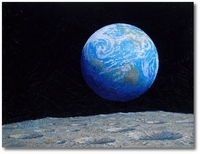 Attending night classes at St. Mary’s College in Maryland in 1962, Alan experimented with landscapes. 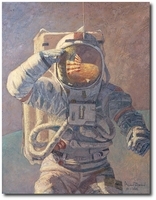 During training and between missions as a test pilot and astronaut, he continued private art lessons. 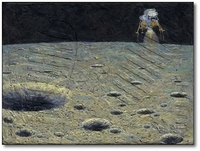 On space voyages, his artist’s eye and talent enabled him to document impressions of the Moon and space to be preserved later on canvas. A voracious student, Alan began to immerse himself in polishing his talent with the same intensity he gave to his astronaut training. 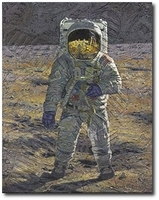 Inspired by the impressionists and studying under contemporary masters, he is a first-rate artist who is as comfortable rendering sharp realism as he is with portraying subtle emotions through a faceless spacesuit—but there’s a bonus: as the only artist who has visited another world, Bean paints with an authenticity and insight completely unique in the entire history of art by creating a palette mirroring his artistic eye. 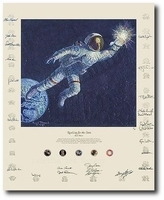 His is a personal portfolio of the golden era of space exploration as viewed by the only artist who has BEEN there. 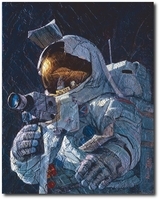 His art reflects the attention to detail of the aeronautical engineer, the respect for the unknown of the astronaut and the unabashed appreciation of a skilled explorer artist. The space program has seen unprecedented achievements and Bean realized that most of those who participated actively in this adventure would be gone in forty years. He knew that if any credible artistic impressions were to remain for future generations, he must paint them now. 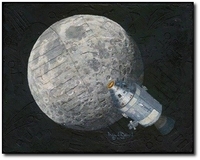 “My decision to resign from NASA in 1981 was based on the fact that I am fortunate enough to have seen sights no other artist ever has,” Bean said, “and I hope to communicate these experiences through art.” He is pursuing this dream at his home and studio in Houston. 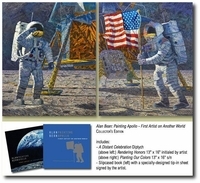 Bean’s book, Apollo:An Eyewitness Account, which chronicles his first-person experience as an Apollo astronaut and explorer artist in words and paintings, was received with critical and popular acclaim upon its publication in 1998. 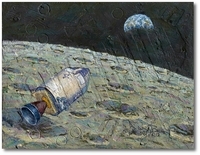 "Apollo Moonscape, An Explorer Artist's Vision"
"Armstrong Heads Beyond the Boulders"
"Beyond a Young Boy's Dream"
"Ceremony on the Plain at Hadley"
"Conrad, Gordon and Bean: the Fantasy"
"The Eagle is Headed Home"
"Fast Times on the Ocean of Storms"
"First Men: Edwin E. 'Buzz' Aldrin"
"First Men: Neil A. Armstrong"
"John Young Leaps Into History"
"The Last Man on the Moon"
"Painting Apollo: First Artist on Another World"
Limited edition canvas - signed by 24 astronauts! 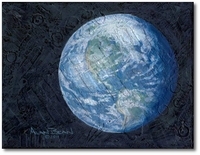 "The Source of Intelligent Life"
"This Beautiful Planet is Revolving Around the Three of Us"